US, 2013, 124 minutes, Colour. Lance Armstrong, Frankie Andreu, Betsy Andreu, Johan Bruyneel, Michele Ferrari, George Hincapie, Daniel Coyle, Phil Liggett, Bill Strickland. 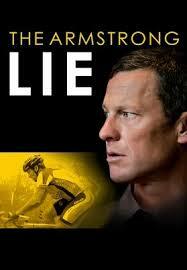 The Armstrong Lie was not the original title for writer-director, Alex Gibney’s, documentary on Lance Armstrong. Rather, Gibney had been looking at Armstrong’s career after he had won seven Tour de France titles and, after his bout with cancer and his setting up of a worldwide foundation for children with cancer, his comeback in 2009 to ride one more Tour de France. Despite rumours of Armstrong’s use of enhancing drugs, he was a hero to millions of people and Gibney followed him on this 2009 ride. The intended title was The Road Back. But, as everybody now knows, Armstrong was found out, denounced by former friends and associates, and eventually, in 2013, gave an interview on the Opera Winfrey Show where she asked him directly about his use of drugs. He admitted to their use. Later in 2013, he agreed to do an interview with Alex Gibney and talk about himself, his lies, his drug use as well as his charity work. Fans of cycling will have much more background as they go in to watch this film, look again at Armstrong’s rides, some of which are described in the voice-over commentaries of the times as ‘astonishing’. They will know several of the cyclists who are interviewed. They will know a number of the journalists and authors who also agreed to be interviewed. Those who do not know so much about the sport but are aware of Lance Armstrong, his career and his downfall, will be fascinated with the interviews, both his strenuous denials of drug-taking in the past, his admitting to the truth in recent years. Most audiences, looking at the earlier interviews, will be completely baffled as to how Armstrong could have said the things that he did, keeping a straight face, defying interviewers, even ridiculing a number of them. How he could be incomplete public denial seems not only mysterious but incredible. Alex Gibney has directed a number of very impressive documentaries including Enron: the Smartest Guys in the Room, the Oscar-winning Taxi to the Dark Side, about American torture in Afghanistan, and the film about Americans sexual abuse by clergy in Sins of the Fathers, Silence in the House of God. In this present film he has been able to bring together his earlier footage for the more triumphant-intended documentary as well as sequences outing Armstrong and his deception. The film does give the opportunity to give something of Armstrong’s background, growing up in Texas, with a single mother, highly competitive at school and in cycling, moving in the 1990s to some championships which led to his entry into the tour to France of 1999, his winning and the subsequent six wins to 2005. He himself often quotes his sense of competitiveness, his desire to win, and certainly his desire not to lose. He is praised as being determined, but denounced as being domineering and dominating. For those not in the know, the frequent and lengthy excerpts showing Armstrong riding and his tactics will seem too long – though they seem necessary in building up this portrait of Armstrong. On the other hand, the many vistas of the multitude of cyclists in various scenic spots in Europe are most arresting. This time the film opens with the interview with Opera Winfrey and Armstrong answering her directly. It continues with the interview with Gibney. It is in this context that the film then retraces Armstrong’s career. Of great interest are the very many interviews with fellow cyclists, who give their impressions of Armstrong as a person, as a character, as a cyclist. Very significant are the 2005 interviews with Frankie Andreu and Betsy Andreu, his wife, who are quite blunt about Armstrong’s use of enhancing drugs – which, at the time, he vigorously denounced. Of great interest also are other comments by cycling journalists, authors of books about cycling, one of them highlighting Armstrong’s previous partnership with George Landis, and his falling out with him leading to Landis also denouncing him. Perhaps it is not a balance to what Armstrong has done, but there is some effective footage in the film, showing him at the time of his experience of cancer and the chemotherapy and its brutal consequences. It also shows his foundation, his travelling the world to raise millions of dollars for children with cancer, his visiting the wards and being with the children. In the 2009 footage, especially when the official organisations suddenly send personnel for blood and urine tests, he is seen with his two daughters. A human touch. In the film which runs just over two hours, there is a great deal of material – and quite a long time to look at Armstrong himself, his face as he denied drug-taking, his face as he talked with friends and clashed with enemies, his face as he finally spoke the truth. And audiences will be still puzzling about how such a high flier could have kept the deception going for so long and then fallen so far.